Owen Leon May died May 5th, 2017. He was born January 22, 1931 to Silas Marion May and Rosie (Long) May in Rushing, Arkansas. He married Vandyne (Davis) May on October 16th, 1954. 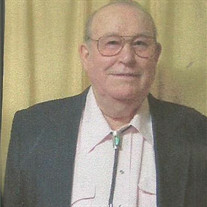 Owen is survived by one daughter, Barbara Stacy and her husband John of Pleasant Plains; three sons, Mark May and his wife Anna of Salado, Steven May of Salado, and Ricky May and his wife Shellie of Salado; five grandchildren, Micah Reynolds and his wife Nora of Beebe, Shawna Gay and her husband Brandon of Southside, Kayla Barber of Salado, Renee Driver and her husband Randy of Georgia, and TJ Stacy and his wife Carrie of Pleasant Plains; two great-grandchildren, Jayden Reynolds of Beebe, and Carys Stacy of Pleasant Plains; a brother, Edward May of Texas; a sister Oleta Stark of Oklahoma; and several nieces and nephews. He was preceded in death by his parents, Silas Marion May and Rosie (Long) May; his wife Vandyne (Davis) May; two brothers, Bufford May, and Harold May; and five sisters, Evelyn Erickson, Reva Payne, Mildred Trotler, Lucy Johnson, and Vera Green. Visitation will be Monday, May 8th from 1-2 PM followed by the funeral service at 2 PM both at the Southside Church of Christ with Bro. Larry Treadwell and Bro. Bill Cline officiating. Interment will follow at the Egner Cemetery of Salado.